Placing an order with PetCareRx is as easy as 1-2-Done! To view your shopping cart, click the 'Cart' button at the top right portion of your screen. To add items to your cart, simply select an item you want and click 'add to cart' on the product page. Once in your cart, you can modify the quantity of the items you have added, remove items, enter coupons and discounts, and select your shipping type. Once you have reviewed the items in your cart, click the 'Proceed to Checkout' to begin the quick and simple process of checking out and placing your order. You will be asked for some contact and billing information. If you are placing a prescription order, you may be asked to enter some information about your pet and veterinarian so we can ensure the accuracy of your prescription order. Next review your order, make sure everything is correct, and click 'submit'. Print the receipt for your records. We will also e-mail you a copy of your order to keep for your records. We accept Visa, MasterCard, American Express, Discover, and now PayPal. We also accept personal checks and money orders via mail. Please make all checks and money orders payable to 'PetCareRx Inc.' and send them to PetCareRx, 52 Merton Avenue, Lynbrook NY 11563. What good are low prices, a wide selection, and knowledgeable service without quick shipping? Orders of in-stock, non-prescription items placed before 2pm EST will usually ship the same day. Please be advised prescription medications will be shipped upon your veterinarian's approval. 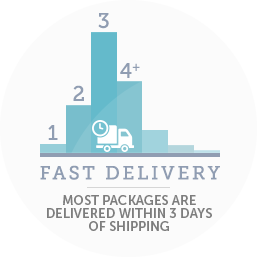 You should expect any order shipped via Standard shipping to arrive at your door within 3-7 business days. Standard orders are shipped via UPS or USPS. All Next Day orders are shipped via UPS and delivered in one business day and one-two business day shipping is via USPS Priority Mail Express. Standard shipping is $5.99, One to three business day shipping is $19.99, and Next Day shipping is $24.99. Orders with pet food or items over 35lbs total will be shipped Ground shipping at rates based on the accumulated weight. Please note that prescription items with Second/Next Day shipping will not ship until the prescription is approved. PetCareRx only ships within the U.S. and its territories. Orders shipped to Hawaii, Alaska, New Mexico, Puerto Rico, Guam, and other U.S. Territories can take from 14-21 business days to arrive. Free shipping offers are applied after discounts and PetCareRx Points Usage to orders being shipped with the contiguous U.S. Shipping is applied to items over 35lbs and pet food based on the weight or product dimension and on larger items. PetCareRx ships pet food to the 48 continental states only. Any orders placed with PetCareRx for pet food, will be shipped within the next business day. Pet food will ship Monday through Friday. Orders placed for pet food weighing over 35 lbs will only be shipped via UPS Ground, which would be expected to be delivered within 5 to 7 business days once shipped. If you order pet food along with other items, please be aware that you will receive your pet food order in a separate shipment. You will not incur additional shipping charges. Vaccines are shipped Next-Day, but orders placed on Friday, Saturday, or Sunday for vaccines will not ship until Monday.